I've been in New Zealand for about three weeks now and I can say, without hesitation, that I've received an education. Water has been at times tough to reach, fish have been tough to spot, tough to present to and tough to get to eat. That all occurs before the sensational take, which has been almost always extremely visible and gets my blood so jazzed up that I pluck the flies from those fishes' mouths before they come tight. It's been an education - one that carries loads of frustration and glimpses of extreme satisfaction. This past weekend, Katherine, myself, Jack, and his girlfriend Liz, planned ourselves a NZ tramp. Jack is a Kiwi friend of Lucas' and I am happy to say that he is a friend of mine too. The river chosen, dates in place and we'd do a fish and hike over Thursday - Saturday. Day one included a hike into the hut and we'd fish as we went. Jack spots a fish, I fish to it, it spooks, no big deal; it's been happening quite a bit to me. I think that I've put 10 fish down to each one that chews, odds I intend to improve upon. Usually we can go from pool to pool, fish to fish. 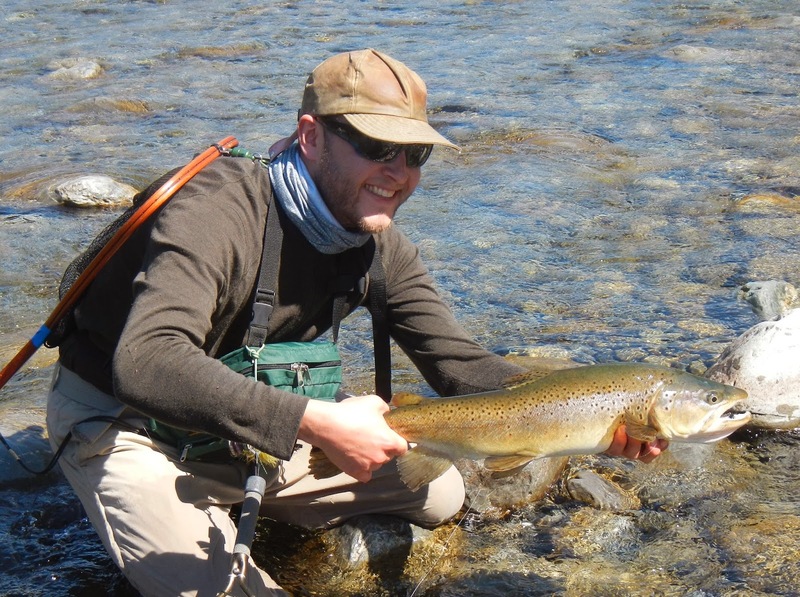 However, one this day, we saw one fish for the first 3 hours of tramping, so when that second fish was spotted, there was a bit more on the line. It was my job to turn that statement from figurative to literal. First cast, "Definitely further up." Remarks Jack. Second cast, "Ok, still needs to be a meter further up and move that cast about a meter to the left." Third cast and the fish rises from the his hold and comes up for an inspection, slight hesitation and then "slurp". A slight hesitation on my end, then the set. The fish races out into the current and finds himself a hold, slowly taking more line until the it becomes clear that a chase may ensue. After a few minutes the fish tires and a river cross allows us to bring the fish into the shallows for an NJ! Marked in at 5.25 lb. We start our way up the river for a fish, the four of us. We are dealing with mixed weather, intermittent rain, hail and wind. The girls decide to head back, about an hour walk, around 2pm. Jack and I set upstream to check out the remainder of the water with the promise to be back before dark. The fishing was tough, the fish present but largely unwilling and easily spooked. Around 5:00 we turned our heals on the river and headed back to the hut. Our 7:30 arrival meant that we would have some light to enjoy dinner with the girls and a nice fire. One problem - the girls weren't there. Another problem - there was no sign that they had ever made it back. Darkness fell in around 9:00 and Jack and I had set a signal fire. We had searched a couple Ks upstream, downstream and the likes. No sign. The rain had stopped but it was getting cooler. 10:00 - PLB (Personal Locator Beacon) was activated. Jack, an avid NZ tramper and fisherman, me, an avid offshore fisherman, we both had been around PLBs or EPIRBs but had never had the need, fortunately, to use one before. We say and waited, next to the river with a ragging fire. Jokes were inserted to keep the mood light and to pass the time. Around 11:30pm the search and rescue chopper became audible and quickly descended on our position. A very professional rescuer met us on the ground and asked for the situation. Moments later, they lifted off looking for two female hikers lost in the region. About an hour passed and the chopper became audible again and returned to us two, slightly shaken and chilled, but exuberant young ladies. You can read the story as it appear in the news here: Camera Flash Guides Rescuers to Lost Trampers. A walk out on a sunny day and deep sigh of relief and our first tramp had been an eventful one. A huge thanks to the Search and Rescue team out of Greymouth, NZ and to Jack for carrying a PLB. Scary! Be careful out there brother.